I emailed Starbucks Customer Service recently. You can see the reply that I got from them. What this tells me is that the Starbucks Refill Policy is unchanged from when I wrote this article in 2013. 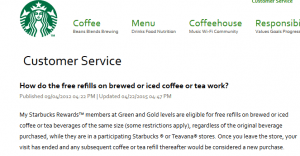 You can read the official Starbucks Refill Policy on their website here. Do not leave the store. You may receive only a few things as a refill: tall iced coffee, tall iced tea (or hot tea), or tall brewed coffee of the day, such as Pike Place Roast. If you wanted another latte, mocha, or anything that is not listed as available for a refill benefit (meaning, tall iced coffee, tall iced tea (or hot tea), or tall brewed coffee of the day) you will pay full price. You will pay a refill fee of about 50 cents (I don’t want to quote exactly because sometimes prices can vary a little from region to region). Present your Starbucks card (registered, and your MyStarbucksRewards profile must be Green benefits or higher), and the register will not charge you the 50 cent (or whatever it is) refill price. There is never any refill perk when you are in the drive thru. Once you walk out the front door of the store, all refill perks have come to an end. You can’t walk in, new to the store and get a refill. You have to have ordered and consumed that first beverage inside the Starbucks. I have seen many, many partners ask me, “Is that your first one of the day?” and then give me a refill price when I haven’t been in the store. This shouldn’t happen, technically speaking. The funny thing about all this is that I wasn’t contacting Starbucks Customer Service to get another recital of the Starbucks Refill Policy. (Since it’s not obvious from the attached email, I received the attached email on 12-20-14). I had emailed trying to get some clarity about the Starbucks January “Coffee Refill Tumbler.” I still think the January Coffee Refill Tumbler is ambiguous. It’s a fair thing for customers to ask, “What does this include?” I can see questions like, “Can I get a vanilla syrup with my blonde roast coffee?” “Can I get an add shot?” “Can I get an iced coffee – after all, that is coffee that’s brewed, it’s just cold.” “If I can get an iced coffee or an odd shot, why not an iced tea?” I don’t think I’m going to get any answers about what the tumbler includes. I contacted an official Starbucks spokesperson at the SSC (Starbucks calls their headquarters the Starbucks Support Center, or SSC) and didn’t get any answer to those above questions. 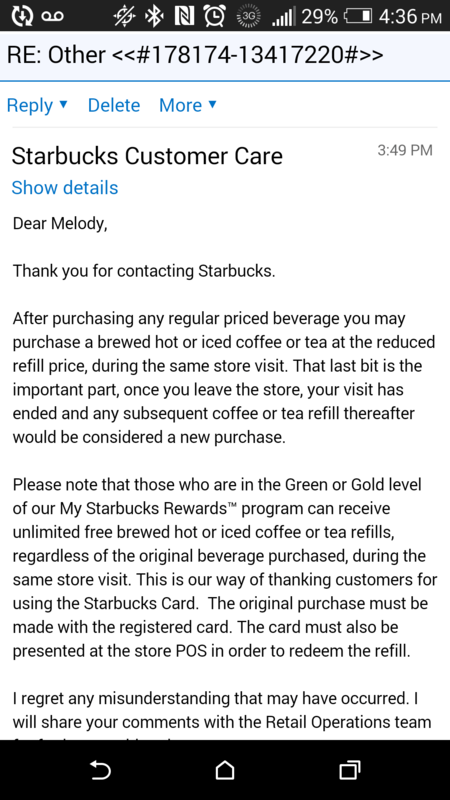 I contacted Starbucks Customer Service and asked about the January Refill Tumbler and got a recital of the refill policy, which isn’t what I was looking for. Given the ambiguity, I think we’ll just have to wait until January and see what happens. I hope that partners resolve ambiguity in favor of customers, but we’ll just see what happens. Starbucks Barista Learns 275 Customer Names; Starbucks Love Defined; Starbucks Pencils and more. It is amazing to me that there are so many different responses and the confusion still exists which only makes it difficult for the partners in the trenches to deal with customers. As you have said before, often customers know more than partners. @purple1 – What’s interesting to me is that the refill policy says “unlimited.” I didn’t emphasize that in the article. I guess the bottom line is that Starbucks knows that it’s silly to tell customers, “We want you to only buy the cheaper drink, brewed coffee to get a brewed coffee refill” and their own numbers show that the overwhelming amount of the business is to-go. Most people don’t stay in the stores. Something like 40% or more of the total business is drive-thru, and most people who come in to the cafes don’t stay. I think I heard one time that 60% of the overall business (cafe and DT) is to go. If they enforce only for those who stay inside the store, it’s a negligible thing. There is an old saying – only your friends will tell you where your warts are showing! I wish the Starbucks customer service department could understand this concept. You’ve pointed out a flaw, hoping they will fix it, but they’re too concerned about not looking bad. Tea generally is eligible for refill as well, and they should give you a new tea bag with the hot water. something tells me that they still haven’t fix the Iced Coffee glitch in the Month of January tumbler. I’m sure everyone’s noticed they ditched espresso tumbler idea (that was a disaster last year). The coffee refill tumblers are good for just the drip coffee, no add-ons or modifiers. Technically they are good for one coffee a day, but if you were to go to multiple stores, there would be no way for us to track it, and I don’t think it would be wrong to do so. Just don’t overdose. Speaking as a store manager, the coffee refill tumbler is just for brewed coffee (or brewed ice coffee). I would say the tumbler is exactly as the name of the tumbler suggests. However, since one our policies is “just say yes” (within reason) , I would offer the customer any refill type drink they’d like. For example : iced tea or hot tea. Keep it simple. Since these are all refillable beverages choices, I don’t see a reason to make a big deal of it with customer. Unfortunately, multiple times in the last year I’ve had barristas tell me that I’m not allowed to get an iced or brewed coffee refill because my original drink was something else. But they would still give it to me “just this time”. @Laily – That is so disappointing to hear. I sometimes wonder how it is that so many stores are so far afield of where Seattle thinks they are? The right answer is a clear “yes” because that is what the policy says – yes – Start with ANY drink, and get your refill as one of the 4 refill items. I was just talking to a 17-year partner (who is about my own age, now an SSC partner) and he thinks that we have a true problem that so many people don’t understand the importance of a great experience and he says “we’re not teaching them to be leaders” – When I read comments like yours, and many others on Facebook, I think that Starbucks needs to wholly come back to telling partners that the experience and the beverage are BOTH important: Customers pay a premium for that. And that the right answer is usually a “yes” – A clear yes. In addition to the $.50 for hot water(which yes was zeroed out with my gold card), I just got charged an extra $.20 for a new tea bag. I’m friends with the manager so I’m going to ask about this but I get the feeling some employees don’t know what they’re doing and just charge up whatever makes sense in their own minds. I am actually so confused on the refill policy even though it is such a simple thing. I’ve heard so many bad stories so I’m scared to ask for a refill. I’m even scared of HOW to ask for a refill so that the partners will understand what I’m trying to order. Haha. it’s funny how such a simple thing can turn so complicated. 1 – Holders of registered Starbucks cards who’ve already reached the Green or Gold level, using their registered card to purchase the initial drink and subsequent free refills. 3 – A hot or iced brewed coffee or tea drink of the same size as the initial drink. 4 – As many times as you like, for as long as you’re in the same store. It’s #2 that there’s so much confusion about. Mainly, over whether you have to buy one of the 4 kinds of drinks you’re allowed to get as a free refill, to get free refills, or whether you can buy literally ANY drink that the store you’re in sells, be it a latte, espresso, chai or even bottled drink. Most people seem to believe, and Starbucks appears to assert, that it’s the latter, but many store employees seem to believe that it’s the former–or, perhaps, pretend that it is in certain stores, under pressure from their managers to save the store money and generate extra profits, which would go against OFFICIAL company policy but what else is new in the real world (and who knows what HQ unofficially tells its managers). My guess is that this isn’t an accident, that Starbucks wants to keep things ambiguous so that it can continue to boast about this policy to attract and keep loyal customers while giving stores leeway to violate this policy to protect their bottom lines. It’s like chain stores stores that advertise a special on some item but when you get there they’re all out and can’t give you a raincheck, even if you get there just as the store opens the day the special begins. They figure that since you’re in the store, you might end up buying something else. Also, it’s kind of insulting the way, when you ask for a refill, employees sometimes ask if you’ve already purchased a drink during that visit, in that store, without leaving–and it’s always in an accusatory, not very friendly way. This happens even if you’ve been in the store for a while and they were the ones who sold you the initial drink. It’s not even about whether you bought the kind of drink they claim you were supposed to buy to get a free refill, but about whether you bought ANY drink initially. I’m not sure if this happens because the employee was told to challenge customers they genuinely suspect of lying about having bought an initial drink, because a lot of people do indeed lie about it at that store, or because management wants to discourage people from asking for free refills, and perhaps even from visiting that store in he future, to save the store money and cut down on what they view as freeloaders, by insulting them. This is all the more perplexing given how often one is given a free refill as one’s initial purchase despite not having asked for a refill. Is this something employees tend to do to regular customers who aren’t the greatest tippers, to get back at them and maybe send them a message? As a loyal SB customer, I get refills all the time. I really think a great solution would be to attach a proof of payment to refills..issue a receipt & have refills be eligible within, say 3 hrs of a store visit. Yes, this is very specific, but I have seen people walk into a Starbucks ahead of me, holding a random paper cup, and order a refill. I also think this makes a dicy situation for smokers who step outside the cafe to have a cigarette for 5 mins, who technically would not qualify for a refill. Why not simplify the policy? I don’t think its too crazy to have people keep a receipt, or not stay in the store for hours on end slurping on refills. I say this as someone who gets ice tea refills, and I really appreciate the policy. I’ve never had a barista give me a hard time; they are always pleasant about it. I’ve never been at a store that would follow this policy. If I ask for brewed coffee after a frappacino purchase they look at me like I’m trying to steal something. They always tell me I can only get refills on the same drink I purchased, brewed coffee refill after a brewed coffee purchase, tea on tea, etc. I have a gold card too, and hadn’t left the store of course. Unfortunately I’m not one to argue or make a scene at the store. So, this is so irritating. I have been at Starbucks since 8am, it is not 10am. I originally ordered a grande iced Americano with soy. Then went up for a tea refill & they guy is like I’ll do it THIS time. This time? Sir stop. It’s a policy you should do it every time. Cmon Starbucks lets all get on the same page. PLEASE!!!!! @Sarah – I’m sorry this happened to you. The right answer to most (but not all) episodes at the registers is just a simple “yes.” There’s kind a trend happening where some baristas see themselves as barista-police to enforce laws. Just like real police officers, they don’t always get it right. It’s not good for the Starbucks experience. In fact, it can be very damaging to the reputation of the Starbucks experience. The change will have to come from real leadership above the store level: Empowering partners to make great experiences, not making partners in fear of being ‘written up’ over every tiniest thing, and further education and training in all aspects of the business. I think though, I might be a minority in the way I think. The refill policy at SB is kinda of a lie!! They never seem nice to give refill!! Is there a time limit on refills? I’ve heard some baristas say that you can only get a free refill within two hours since the original purchase. My experiences asking for a refill are sometimes alright, they said yes and that’s it, but other times, they looked at me “like um no sorry you can’t do that, but I’ll do it for you this time.” And I’m sometimes too afraid to ask to the refill anymore even though it’s my benefit I should get. I have a question about this refill policy. My local Starbucks has tables set up outside the store for their customers. Can I still go out there and sit and enjoy my coffee and still get a refill? Terrance Ghares, technically you’re on store property if you’re on their patio area. So technically yes, should be able to use the refill policy. The challenge is just that you’re out of sight of partners, and some at the register might challenge you and say you left and came back. I recognize that it should go smoothly, but it’s possible it won’t always. So I stumbled across this a while back when I was trying to figure out what the refill policy was without making too big of a fuss at the store, and went in my first time pretty confident that I could clarify to the barista that this is the policy if there was any confusion. Since then, at my usual store, not only has this not been a problem, but the first time I said something about a refill the barista grinned and said, “What’s more – you can start with ANY drink, so you could get a latte or a mocha, and then get tea as a refill.” Awesome, I thought, this is exactly in line with what that blog said. Now, I’m sitting in a Starbucks across town, and this time I had trouble. Either the barista (and manager) or I are misunderstanding the policy. I’m starting with a Frappuccino, and asked if I could do a hot tea as a free refill. First, they said it doesn’t work that way – the Frappuccino wasn’t a part of that policy and/or I had to start with a tea or coffee, and you could only get a refill of that drink. When I said that the policy says I can start with any drink, she thought about it, then looked confused, but agreed. When I clarified, again, if I could get a hot tea as a refill if I got a Frappuccino, she said, “No, I don’t think it works that way. It has to be hot to hot or cold to cold.” So I agreed, got my Frappuccino, and am not planning on asking for a refill of even iced tea. There seems to be a good amount of confusion, in general, about this policy. I’ve read it over multiple times, and it doesn’t specify that it has to be a hot to hot or cold to cold refill. If the issue is switching cups, that’s not an issue at all because when I switch from coffee to tea or when I’m on my third refill or so, they offer to get me a new cup, anyhow. I don’t blame the poor barista – I’ve worked in food service/retail where people will try to squeeze as much free/discounted stuff out of you as they can, and your manager is breathing down your neck making sure you’re polite but not losing any money – I just wish that Starbucks would make this policy clear cut across the board to all employees. I don’t like to make a fuss, and I don’t like to look like I’m trying to bend the rules (which I’m not). Hi Nicole – So disappointing to read. Once a business starts making a lot of rules the company culture, then employees will just start making their own rules too. Starbucks has completely drifted in the direction of the barista-sheriff liking to give infractions out, even when they’re not right, as in your case. I suggest you contact customer service and let them know of your experience. The rule doesn’t say hot to hot, or cold to cold – that’s someone adding in their own rules. Please call customer service and let us know what happened. There are two ways to solve the refill dilemma. First, get a receipt every single time and IMMEDIATELY call Sbx customer service and complain, being sure that customer service makes note of the store number, time AND EMPLOYEE name/number. Often times the Sbx customer service will then issue a small increase on your card to make up for the confusion. THEN that info is sent to the store manager who has to explain the problem to the area supervisor AND educate the employees. If multiple calls are made on a specific store, the complaint ticket begins to make its way up the administration ladder. THEN, when ultiple complaints continue to be made against Multiple stores on this SAME issue, the issue will land on the desk of the administration and decision makers. SOOOO, what can YOU do? Not necessary to confront the individul store employee, just call customer service IMMEDIATELY and do it EVERY SINGLE TIME. The SECOND METHOD to change this is a class action lawsuite. Of course, generally the attorneys firm will benefit most from this, but it is in the attorneys best financial interest to fight until the issue is resolved in teh interests of the general public, so I’m ok with this method as well. Hmm 1) Take Action or 2) Complain. It’s your call! Good luck everyone…. The best way to solve the problem is to stop this policy. Then it’s clear: no refills. We will still use the card for convenience. I tried the refill thing once and I felt cheap. I felt exactly like everyone talking in this forum. Am I the only one to feel this way? Would you still drink Starbucks coffee if they removed the refill policy? Absolutely I would not go if they stopped the refill policy. I *always* drink two cups, every single time. I dont need the expensive, sugar filled la te das, just caffiene. I am a super efficient, high productivity person. Without my coffee, I am just an unstable little bottle of nitro, looking for a place to go off. I’m a Starbucks partner and at my store, we are all familiar with the refill policy, and probably more aware than our customers that the first drink can be any choice. We often have challenges when customers bring their own personal cup and announce they’d like a refill (when their first coffee was actually at home, in their own kitchen!) and, more recently, when a customer purchased her first beverage at a store across town, then rode her bicycle to our store and wanted a refill. She didn’t understand why this was outside the refill rules. We do handle all these situations with a smile (and a refill), and if they have questions about the actual policy, we do refer them to Corporate for clarification. I don’t believe it’s a vague policy, but I can see where customers and partners become confused. Hi Claire – That’s a beautifully thoughtful reply. Your store sounds like it is well run! Which I could visit your store. That’s perfect – Smile, give refills, explain the policy, and an understanding of being in the people business serving coffee, not the job of state patrol. Thank you. Does the following situation come under the refill policy? I receive a “free drink” notice from Starbucks on my gold rewards card. I redeem the free drink. 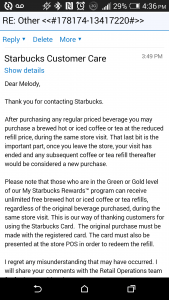 May I then get a just regular coffee refill for free under the refill policy for gold card rewards? Thanks, Melody, for your kind comment. I do believe our store is committed to quality and to being in the people business — and we happen to serve coffee! We work very hard. @Wizeiz, I’d say yes to your question. Your reward was an “earned reward” and, in this case, it doesn’t really matter if you paid for your initial beverage or not. You should still get a refill using your Gold Card. Our customers often “pick up” each others’ refills, especially for our resident homeless man who doesn’t have a Gold Card, yet always purchases his first venti Pike Place, or lately, his venti Earl Grey tea. My daughter purchased the January Refill Cup as a Christmas gift. In past she always gave me a gift card that lasted me many months. The cup as you know only is $40 and only good for the month of January. Mostly, I only drink lattes. But when I tried to exchange the cup for a card, the stores sent me to other locations, saying they couldn’t exchange it. When I began protesting, they gave me cell numbers of store managers who never returned my calls. Now it is January, and I feel certain that my cup will be mine, even though I will never use it. Starbucks has suffered the loss of a loyal customer. I am very disillusioned. @CD, that is a wonderful idea! @John, I too received this cup from my daughter for Christmas and drink iced lattes when I go to the store. I do however drink hot beverages at home and the office, I just love coffee anyway I get it. The tumbler is of high quality and keeps any hot beverage hot for hours and hours and with proper care will do so for years to come. Every time I use the cup I will always remember that my daughter gave it to me because of the unique design not because it cost her $40 and I got “her” money’s worth of free refills for the month of January 2016. It was a gift and that memory is and will be priceless; it cannot be altered based on the type or quantity of refills that the tumbler will get me. Well I just had a Venti Iced Americano at my regular store. Asked for a refill and was told by some new guy that I couldn’t get a refill on an iced drink. First time I had ever heard that and I didn’t want to argue with him so I just paid full price for another iced Americano. So what exactly is the policy ? Like I said I’m in this store every day and this is the first time this happened. Who is right ? The new guy or the people who are usually there who always just give me my 50 cent refill that costs me nothing since I have a gold card. @Harold Banks, your refill would have been your choice: an iced coffee, a cold brew iced coffee (but not an Americano) or a hot brewed coffee, an iced tea or a hot tea. As long as you enjoyed your first beverage in the cafe, did not leave the store (theoretically) and wanted a refill of any of the items I listed, you are within “policy” for refills. We have a customer that refills his venti black iced tea at least three times each day, so Starbucks DOES refill iced drinks. If you were, however, asking for a venti iced Americano for your refill, then no, technically, you couldn’t get a refill for 50 cents because it is an espresso-based beverage. I bought an espresso and a request for a refill of a brewed or ice coffee was rejected by my local Starbucks in Massachusetts earlier today. I stayed in the store the whole time. @Gerard The policy is the same. It now says purchase a beverage without specifying what beverage. In the world of Starbucks, “yes” is the right answer like 90% of the time, and in your case you should have gotten an iced coffee. Though I’m not clear if you got an espresso shot or an espresso drink. You should call or email Starbucks Customer Service. I just spent about 15 minutes on the phone with customer service arguing this point after all these years since the first time I had to convince a store manager by showing them the Gold rewards online that I do get a free brewed coffee refill on a specialty drink if I haven’t left the store and present the same registered card I originally used to pay. I couldn’t convince this customer service women. I finally decided to just try it and see what happened. Voila. Free brewed coffee on CM or at least it doesn’t look like I’ve been charged so far on the app. This policy didn’t work at “17th and Lawrence Store”, 1125 17th St, Denver, CO.
Matt – I am sorry. I suggest you contact Starbucks Customer Service. So long as you stayed in the store, you should have been able to get your brewed coffee as a refill. I often talk about how Starbucks is a roller coaster ride – it’s a crisis of highs and lows. Unfortunately, there’s no sign on the horizon that the headquarters will do anything about the incredible lows of the customer experience that are present now. Please call Starbucks Customer service. Thank you, Melody. I agree with you. I’m big fan of Starbucks and I have been to many stores in US. I can say that most of them take care of customers very well. There are still some stores that do not understand the policy well but that’s not really a big problem, but this case is too much. As an update, I have emailed to Customer Care and, at least, I promise to raise this issue to the HQ and district manager, which is a good sign. Is there a two hour limit for gold-card holders on getting a refil on a Starbucks beverage?